May was a lovely month wasn't it. So much green and growing. Warm and wet and some gorgeous sunny moments.....even the soft and gentle rain in may could be forgiven. I have been soaking up all the lovely nature around. I've needed it so much and I notice it so much more now I am no longer just a suburban girl. I have a dog and a garden and hills to roam, and it's wonderful to be able to anticipate what comes next as the year unfolds. This common has become a part of me. It has become my life blood. I can breathe in life up here. 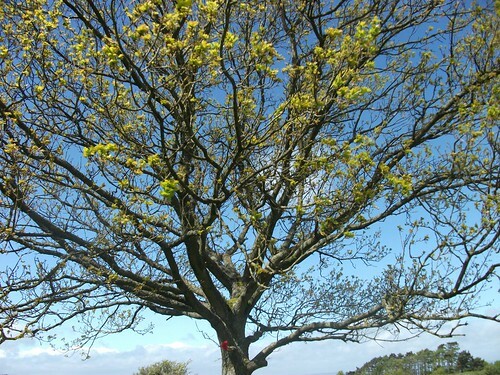 The open, wide expanse of skies, new leaves against the blue, my favourite. Awesome. 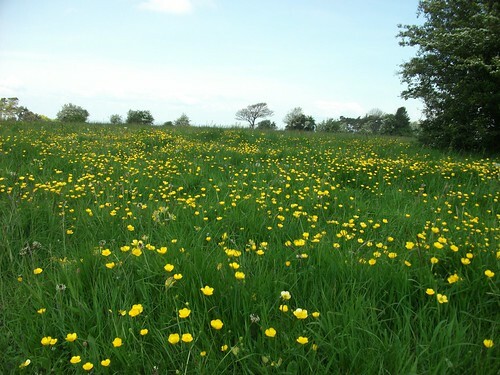 The Buttercup meadows, the Daises and the grasses beginning to grow in abundance. Of course May saw the arrival of others who also love the common! 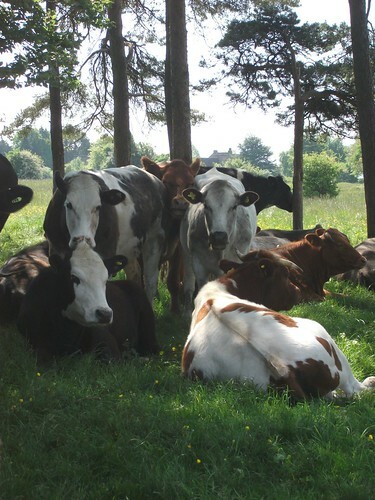 Yes the cows are out and there's a fair bit of jostling going here for a space under the cool shady trees! They are remembering their summer ground and the places they like to go. They are such big beautiful creatures with their big brown eyes. Mainly a little shy of the humans. Getting barked by the occassional passing dog. Everyone will have to make room for the new arrivals and find their place. There's room for everyone up here. 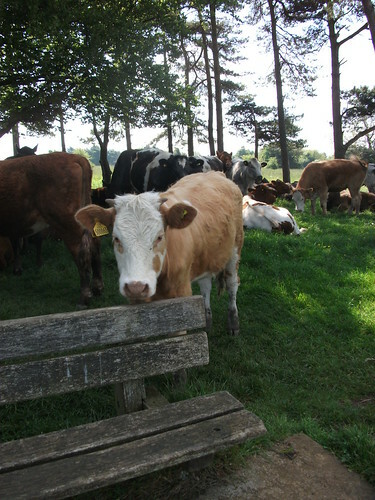 having a scratch on the bench! I found these funny pictures in the National Trust booklet! keep little dogs under control! We try and walk past carefully, not too close because I don't want little dog to be kicked by big hooves. 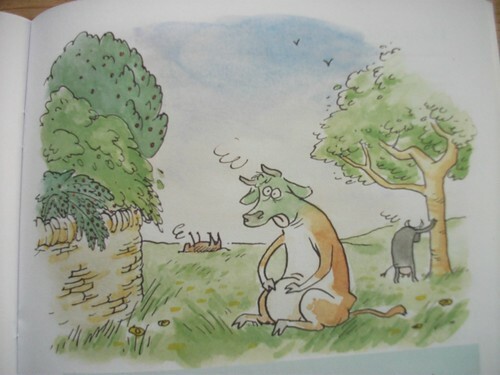 Daffodils are not good for cows. Daffodils are poisonous for cows. I didn't know that. That would be why you only see wild flowers up here. The grazing rights for the common go back to the days of William the Conqueror. 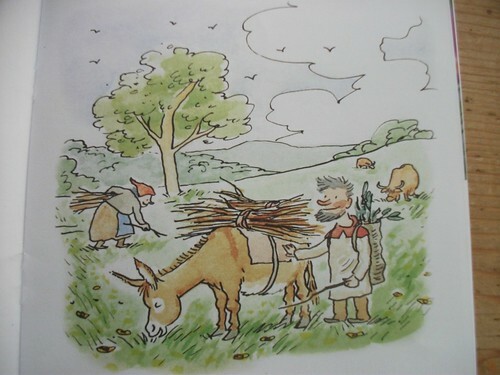 I will look out for the horses and the donkey who follows them around. So here is our daily view. This bench says 'a lovely view for a lovely lady'. Her name was Betty. It's a top spot. 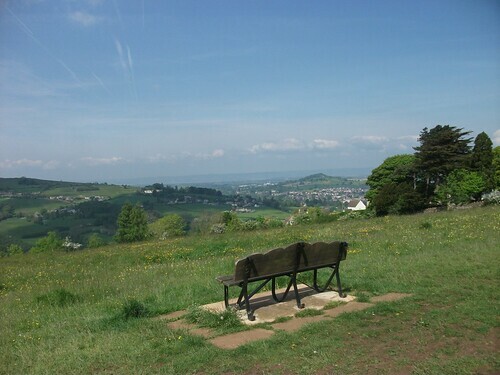 We can sit awhile, take in the view out to the River Severn and across to the Black mountains and Wales. We can watch the Magpies and the Ravens circling in the warm currents and dream of the place where the river flows into the sea and the coast line and beaches and the ocean. All from the view on our hill top. 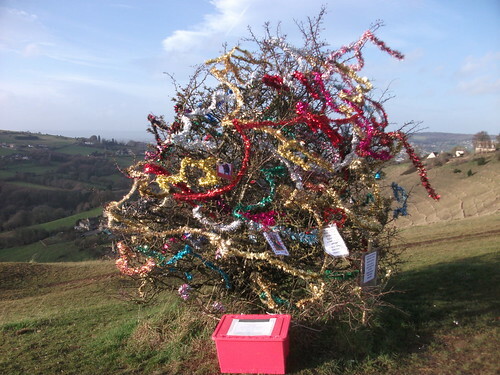 And here is the famous Hawthorne tree, which at christmas becomes this. Well I've brought you up here with me many times now, I hope you don't mind. I've even bumped into two fellow dog-walkers/bloggers, which is strange because you kind of know them and you kind of don't! 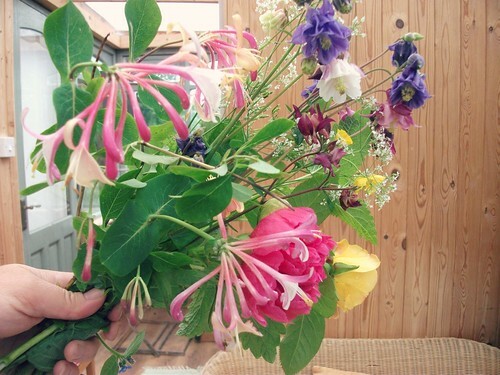 At home I have been picking a lovely supply of flowers from the garden. 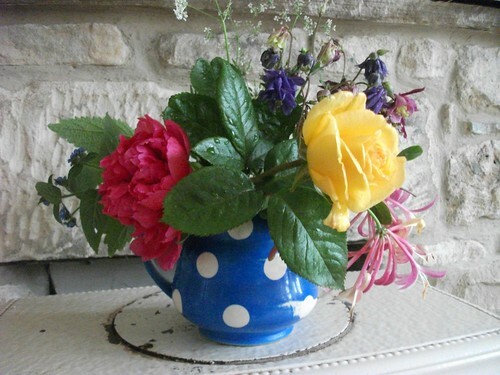 and enjoying them in this blue spotted jug. I think it was a second, because of the misprint, but I love it and the glaze and the shape. Underneath it says made in Japan. I have a couple of creative makings to show you, but to be honest my energy levels feel quite low right now. I need to take some photos and share some little adventures from this half term. But I'm taking it pretty slowly right now. Just trying to recover some of that energy again. The last week seem to involve a lot of driving around dropping the teen off at his Dads for a few days and then back home to a couple of days of sanding and painting, touching up the teens room. I just want it to feel like a fresh space. 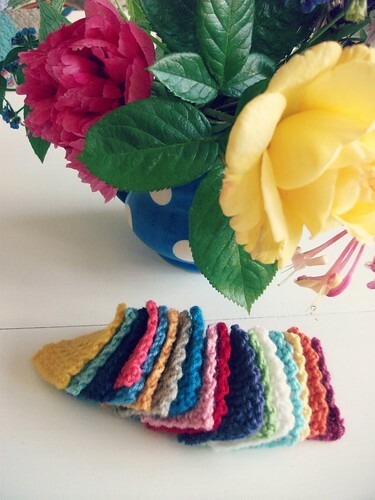 a string of colourful bunting. But oh go on. Just a little one then! A little project, inspired by Ingthings, I can't remember where on her blog I saw this. I still have to string it together, but it will make a little bunting for the summer. Well dear people, that's it for now, can't wait to share my other projects, have a great week. Hope all is well. What a gorgeous walk and beautiful views. I can see why you love it! I love that place, too!!!!!! 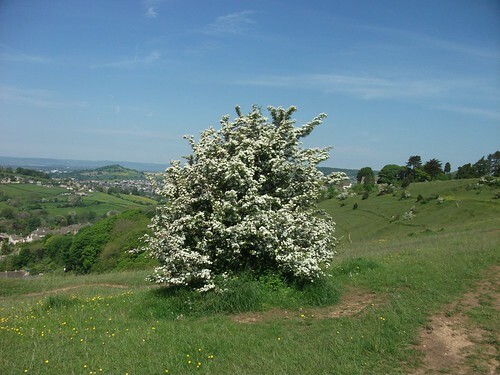 As a walker I have to confess to being more than a little jealous of that wonderful common area where you go for walks! It is beautiful, and looks very peaceful (well, except for the cattle!). I hope your energy comes back this week, and that you have lots of sunshine to help it along. Totally agree May is just such a wonderful Month. You are truly blessed having such a wonderful walk and views and that little blue spotted jug is a delight. Such lovely photos. I really enjoy seeing the seasons change in other parts of the world. The NT book was fun, thanks for sharing. The drawings are funny. I had no idea about daffodils and cows. Such a beautiful post! 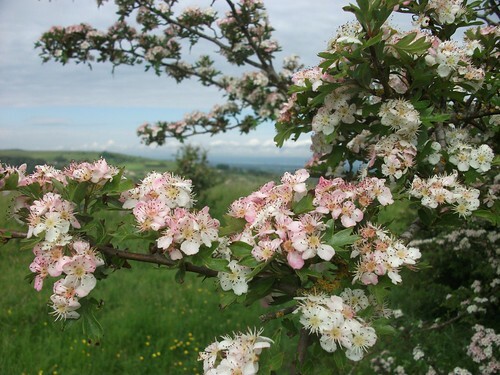 What amazingly beautiful walks, and I just love the hawthorne in summer, and in winter. How nice for Betty to be remembered at such a horgeous spot! How utterly picturesque! You've really captured the essence of the season here. What a lovely view from Betty's bench! I think I'm lucky where I live, with the views when I'm out walking, but it's nothing compared to that. It's pretty flat round here. A lovely post. Enjoyed going on your walk with you. I love cows too - dad was a dairy farmer. But I had a bit of a frightening experience last year when my dog decided to chase them on our usual walk around the village. They ran from him at first but then turned round and began to chase us. Dog changed his mind. Managed to get through the gate before being squashed. 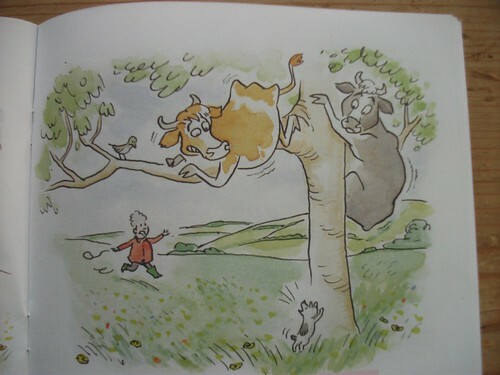 Now take another route when the cows are out. I love going on these Common walks with you. You live in such a beautiful area. and Betty's bench is so sweet. I would love to be sitting there right now. Hope you have a wonderful day. It's magical.. Have a great weekend! Buttercup fields forever. I'm just discovering all the delights the countryside has to offer - I feel like I've lived at the coast...forever!